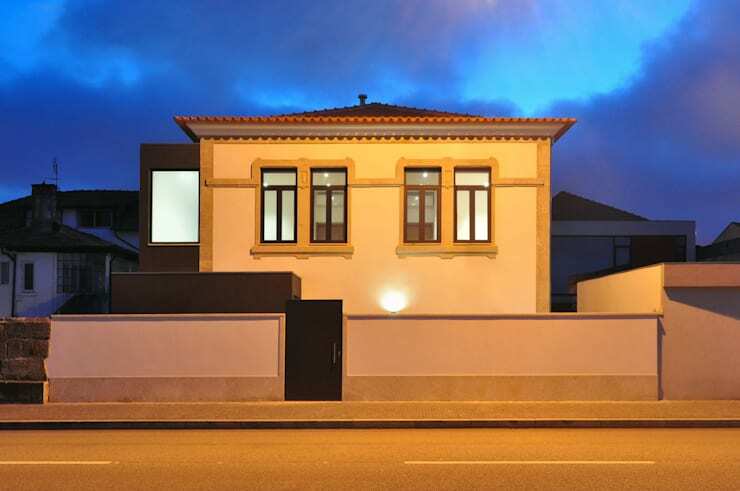 Portuguese architects and designers, INSIDE, know what European style is all about. Today, we are going to be exploring Villa Margarida in all of its glory. Simple and sophisticated, with a touch of character, this is a home that would suit any neighbourhood or city. However, it's reminiscent of a wonderful, Italian home where a family would cook delicious pasta, eat rich gelato and drink wonderful wine. From the front of this home, it's clear to see that it is simple and elegant. The architects have gone for a double-storey design and a very symmetrical look and feel. The home is also surrounded by a brick wall, allowing for absolute privacy when the kids are playing in the backyard, mom and dad are braaiing or the family are partaking in some gardening. A simple, dark wooden door provides access to this home. The designers have gone for very blonde colours throughout the exterior, but have complemented these with a darker section of the house on the left, which matches the door. The window frames are done in the same, dark, chocolate brown colours. Don't you think this emphasises different sections of the house, enhancing the shapes and blocks used throughout? We can see that the blonde theme fro the exterior has been used throughout the interior, with gorgeous light wooden floors and light wooden wall panels. This contrasts with the gorgeous stone walls and the large, glass doors that open up the house onto the garden. 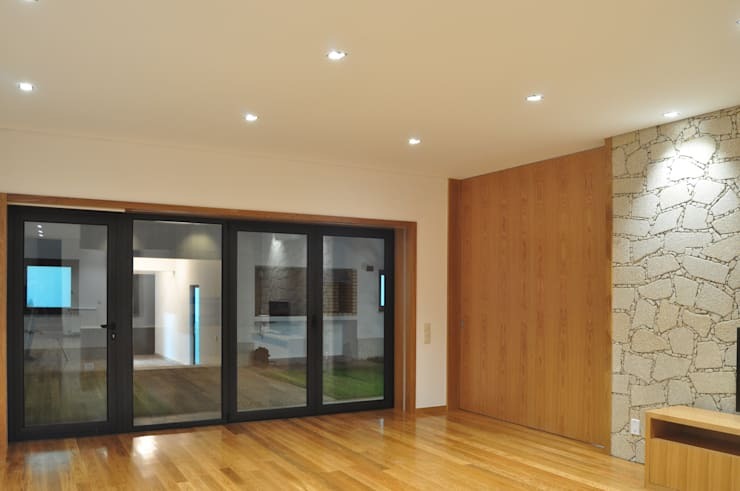 The large glass doors are a prominent feature in the home and are a great addition to any modern space. They allow an abundance of natural light to filter into a home, creating a light, bright and warm environment. The designers have included very subtle and small dimming lights for the evening, which provide a wonderful glow in this part of the house. Ambiance is key! From this angle, we can see how important privacy is to the family, with designers opting for a home that features the latest in modern elements. The designers have included blinds or screens, which roll out in front of the large, glass doors, offering privacy to the family if they need it. It also blocks out the light—perfect for people who work night shifts and need to sleep during the day. It also means that when you are away for the weekend, no one can peek into your home! When you want to open the house up again, simply roll the screens back! Easy and convenient. 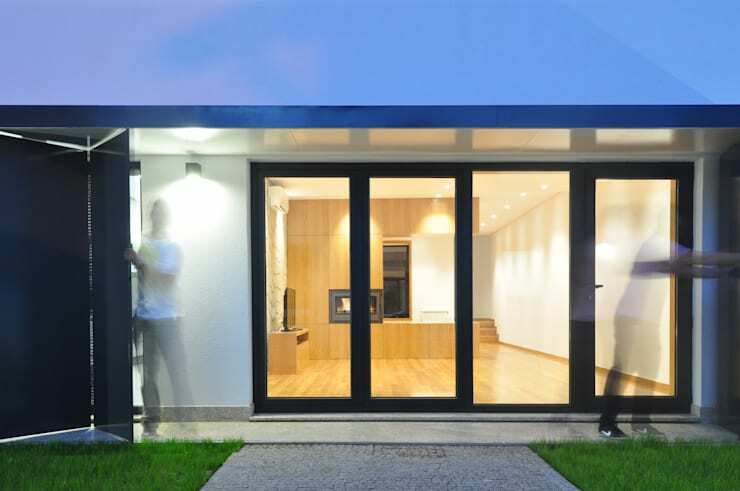 If you enjoy smart features in your home too, you'll love this ideabook on: The small yet smart family home. From this angle, we can see that this room has probably been designed as a living room, as it is a big, open space with sprawling wooden floors. This is where you can fit beautiful, cushy sofas and gorgeous, antique coffee tables. Whatever your style is, this is a space that you could work with. There are also wonderful, white walls in this space, where your artwork, photographs and pictures could hang. It's like a blank canvas for your decor tastes. The designers have also included a trendy fireplace in this space, which is simply perfect for winter. Winter is coming in South Africa so have a look through our range of homify fireplaces for inspiration for your own home. 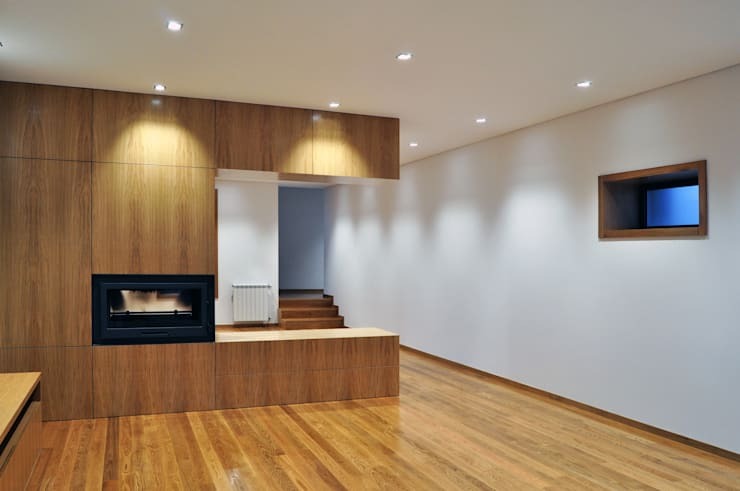 In this image, we can see how the designers have really made the most of wood, throughout the interior and exterior of this home. 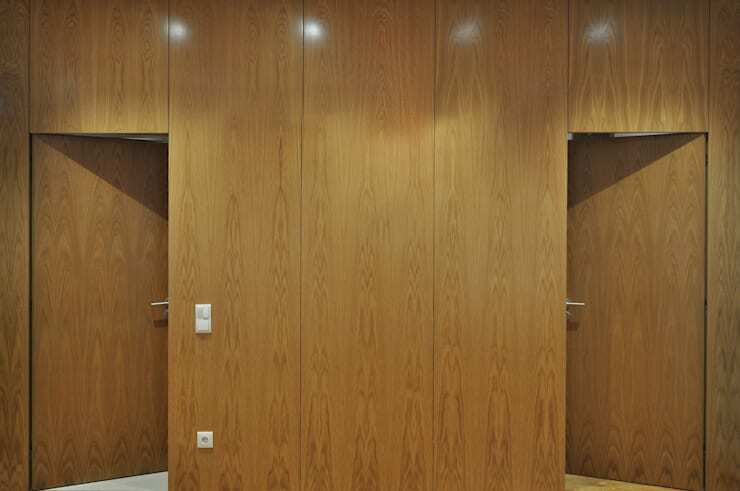 Wooden panels are used throughout this particular space, with wooden doors etched into the facade. Remember that if this suits your taste, you can also opt for a darker wood or a lighter wood. If you like wood, have a look at this dynamic home of wood and glass. We end off our tour on this gorgeous stone staircase, which leads up to a large, glass window. The sand-coloured stone is indicative of how natural materials have been sourced and utilised for this home, creating a very warm and earthy environment. 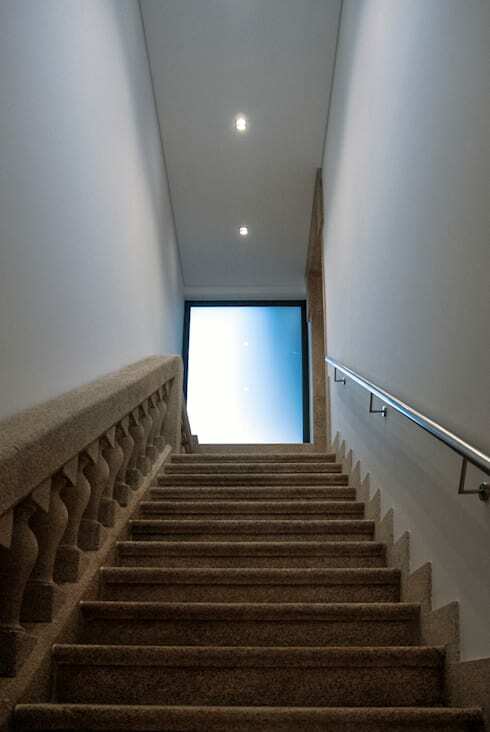 The large glass window allows an abundance of light to filter into this space, which is wonderful as you don't want your staircases to be gloomy and dark. Tip: Always ensure there are rails on each side of your staircase so that no-one topples over! Everything about this home is warm and family-oriented, where sleek design, functionality and privacy are key. What do you love about this home? Do you have a favourite room? Let us know!